Though the topics and themes are much the same as American erotica, the British use of English adds a luster to the stories, missing from the vulgar used in America. 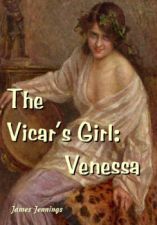 In a sedate rural village in late 19th century England, the beautiful Vanessa lived quietly with her brother until the day the lustful local vicar took her in hand. In time, the modest hamlet became a hotbed of passion as Vanessa turned her newfound skills toward luring other households into their secret coterie. The house that stood on the edge of the moorland had a look of total remoteness, as if all within were quiet and ever would be so. White palings, newly-painted, surrounded the frontage and - reaching halfway around the back of the stone-built residence - gave way on either side to a barred gate which led into a paddock where a horse was grazing. Reining in his own quiet nag, the Reverend Percival Jubstone wondered which of the two new inhabitants of Edgemoore, as it was aptly called, were at home. It would almost surely be Miss Vanessa Markham, he told himself, since her brother would be at his teaching post at this hour. Village gossip, which so often reached his ears via his housekeeper, told him that she was an attractive woman. He hoped it would be so and, having tethered his horse, took the path to the front door and drew upon the bell, hearing it jangle within. Scarcely a moment passed before the door was opened by a young maid, cap askew and with a cloth in her hand. 'Your Mistress is in?' enquired Percival politely, taking note all at one and the same time of the girl's age, which he judged to be about seventeen, the slimness of her figure and the promising gourds which her black dress revealed. 'Oh, sir, your Reverendship!' Mary uttered, quite taken aback by the appearance of one who seemed to her such a lordly person. 'It is all right, Mary', came a voice from an adjoining room, and therewith appeared Vanessa herself - a comely young woman indeed of perhaps twenty-eight or so, as the Vicar immediately perceived. 'Yes, ma'am', Mary said almost thankfully, for it was her first day at the house and no one had told her how to receive visitors, this in great part being because Miss Markham had expected none as yet. Edging away while trying to give all appearance of not really doing so, Mary succeeded in giving way to both and scuttled thankfully back into the kitchen. 'I thought to call - to make myself known. Forgive me if I have arrived at an inopportune moment', boomed the reverend gentleman. 'Not at all, not at all - pray come in. I am sorry about Mary's ineptitude. She is young and�"
'Untrained?' he interrupted her as they entered the small drawing room that was pleasingly uncluttered. 'Forgive me for having broken across what you may have been about to say, Miss Markham. It is a matter to which I have given much thought, however'. 'Yes?' asked Vanessa in a tone of voice that to some more sensitive souls would have appeared strained. Indicating a comfortable armchair for her visitor, she took up her seat on an equally-well-padded sofa which the Vicar regarded with a professional eye - professional, that is to say, in relation to his private interests, for the arms of the piece of furniture were nobly curved and were winged outwards at an angle which was immediately cogent to his thoughts of how one such as Mary could be put over one of the arms with her bottom well up.